You can listen to a podcast review of this movie below, or subscribe to Bina007 in iTunes. The movie opens in media res, with a fantastically exhilarating air skirmish between US and Japanese planes in the Pacific. This has to be one of the best air-fights on film and testament to Jolie's skill as an action director. Our hero is a young bombardier called Louie Zamperini (Jack O'Connell) alongside his friends Mack (Finn Wittrock) and Phil (Domnhall Gleeson). Pretty soon they're shot down and forced to endure weeks of starvation, dehydration and shark attacks in a small dinghy. The movie feels almost like animal horror at one point and was genuinely tense. The actors beautifully trace out the psychological impact of such trauma. In flashback we learn that Louie was a troubled kid, acting out against petty racism, whose elder brother harnessed his talent for running. He ended up winning bronze at the Berlin Olympics against all odds by conserving enough energy to make a late break. The lesson is, absorb the pain to gain a lifetime of glory. This lesson is put into use in the second half of the film where Louie is rescued by the Japanese and put into a succession of prison camps, each more harsh than the other. Some of the visual images from this half are seared into my memory. Emaciated soldiers naked, kneeling thinking they are about to be executed. Soldiers covered in coal-dust bent under the weight of their load. The real story here is one of a bizarre obsessive and almost pitiable relationship between Louie and his tormentor, "the Bird", played by Takamasa Ishihara. In a relationship similar to that between Epps and Patsy in 12 YEARS A SLAVE. For Louie the only task is to endure and for the Bird, who knows? Overall, the film felt like a truly insightful movie about humanity pushed to the extreme. I found it inspiring and unforgettable, and technically very impressive. Jack O'Connell is impressive but I found Ishihara's performance to be the most captivating and enigmatic. 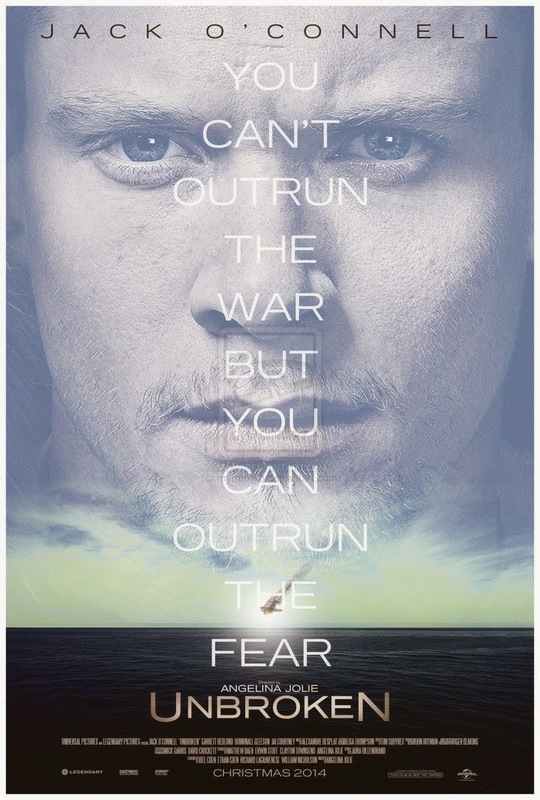 UNBROKEN has a running time of 137 minutes and is rated PG-13. The movie is on release in the USA, UK, Ireland, Greece, Kuwait, India, Iceland, Poland, Belgium, France, Denmark, Croatia, the Netherlands, Portugal, Slovenia, Estonia, Lithuania, Latvia and Sweden. It opens next weekend in Austria, Australia, Brazil, Germany, Kazakhstan, Russia, South Africa and New Zealand. It opens on January 22nd in New Zealand, on January 23rd in Romania, on January 28th in Trinidad and Tobago, on January 29th in Argentina, Italy, Mexico, Finland and Norway, on February 5th in the Czech Republic, Hungary, Malaysia, Singapore and Ukraine, on February 7th in Cambodia, on February 18th in the Philippines, on February 20th in Turkey and Vietnam, on February 26th in Hong Kong and on March 5th in Thailand.